Albuquerque, NM – In a titanic effort that garnered twice the necessary signatures in half the required time, pro-life groups spearheaded by Project Defending Life have submitted 27,000 signatures to the Albuquerque City Clerk on a city-wide legislative petition to ban abortions after 20 weeks gestation. That number of signatures virtually ensures the proposed late-term abortion ban will be on the ballot in an upcoming election, possibly as soon as October 8. “The concerned citizens of Albuquerque were able to obtain 27,000 signatures, well over double the necessary number, in less than 30 days! Due to the overwhelming support of Albuquerque registered voters, we are calling on the ABQ City Council to listen to the resounding voice of the people and adopt this ordinance as written and ensure that this Pain Capable Unborn Child Protection ordinance will make it onto the October 8 ballot,” said Bud Shaver spokesman for Project Defending Life. 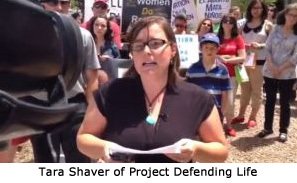 Albuquerque is the home of Southwestern Women’s Options, the largest late-term abortion clinic in the U.S. Project Defending Life’s Tara Shaver has obtained nearly a dozen 911 calls that document all-too-frequent abortion-related medical emergencies at that clinic. The Shavers have also obtained a consent form given to late-term abortion customers by Southwestern Women’s Options that confirms that abortions after 18 weeks gestation carry higher risks to the women than birthing a full-term living child. “The statements made by this notorious late-term abortion clinic about the risks of abortion past 18 weeks bolster the need to protect women and their babies from the admitted dangers of this grisly and barbaric abortion procedure. The city ordinance is a reasonable way to protect the public,” said Troy Newman, President of Operation Rescue, which has worked side by side with Project Defending Life to expose and end late-term abortions in New Mexico. The city-wide effort is unique and has garnered national attention since revelations of gruesome abortion abuses surfaced at the trial of convicted murderer Kermit Gosnell and against Houston abortionist Douglas Karpen. Women come from all over the U.S. to Albuquerque for abortions in the latest days of pregnancy – abortions that are illegal in most states. Once the signatures are certified by the City Clerk’s office, the City Council will have three options for handling the petition. It can adopt the measure, in which case no vote would be needed and the new proposed ordinance would become law. That option appears to be the least likely scenario. The City Council could attempt to amend the language, in which case both the petition language and the amended version would go up for a popular vote. However, the most likely course of action will be for the City Council to simply ignore the petition, which would require the measure to be placed on a ballot for a city-wide vote. If the city officials drag out the process and miss placing the initiative on the October 8, ballot, the city would be forced to hold a special election at the cost to the city of around $500,000. Pro-life groups worked hard to garner enough signatures in half the allotted time in order to avoid the extra expense of a special election. Already the local media is putting forth the fallacious argument that if the late-term abortion ban is approved by Albuquerque voters, it would be nullified as being in conflict with state law. However, that is simply not true. The U.S. Supreme Court has upheld the right of states to make laws restricting abortions in the later stages of pregnancy. Eight states have passed similar laws, most recently in Texas where pro-abortion forces attempted to disrupt the state legislature to hinder passage. However, an ABC/Washington Post poll released just yesterday confirmed that 56% of Americans support restrictions on abortions after 20 weeks gestation. Operation Rescue will join Project Defending Life and the Survivors for a pro-life event in Albuquerque, which will be held August 2-10. They will train activists and bolster support for banning late-term abortions there. Both Newman and Operation Rescue Senior Policy Advisor Cheryl Sullenger will be featured speakers and presenters. For more information about the upcoming pro-life event in Albuquerque, please visit ProLifeWitness.org. Operation Rescue encourages the public to contact the nine members of the Albuquerque City Council and urge its members to ensure that the measure gets on the ballot without amendments for the October 8 city-wide election.